Your teeth are one of the first things that people notice about you. Damaged or discolored teeth can leave you feeling embarrassed or insecure about your smile. Luckily, dental crowns can help restore the look, size and shape of your teeth. With the help of Kanata Dental, you can have a flawless smile in no time. With natural-looking options like composite resin and porcelain crowns, you no longer have to deal with the embarrassment of missing or broken teeth. At Kanata dental, the outer surface of your damaged tooth will be removed and replaced with a cap that looks exactly like a tooth. No one will be able to tell the difference. Porcelain or resin crowns are great long-term solutions to your dental problems. On average, they can last anywhere from five to fifteen years depending on how well they are cared for. You can extend the life of your dental crowns by avoiding things like clenching or grinding your teeth. Do you avoid beverages like soda, wine or coffee to avoid staining your teeth? Depending on what type of dental crown you choose, you may not have to worry about that much longer. Certain types of dental crowns, like porcelain for example, are made from stain resistant materials. This makes them an ideal pick for prosthetic dental procedures. Unlike dentures, you never have to worry about dental crowns slipping out of place. If the crown is replacing a missing tooth, a dental bridge will anchor it in place. 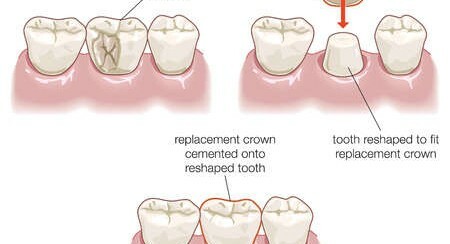 For damaged teeth, the crown will be cemented over the tooth. When your dental crown is applied by one of the experts at Kanata dental, you never have to deal with the embarrassment of a dental mishap. When dental crowns are applied to the surface of decaying or damaged teeth, it can help protect them from any further decay. In cases of cracked or broken teeth, the crown encases them, effectively serving as a splint to bind the tooth together. In both of these cases, the dental crown allows you to protect or preserve your tooth. Dealing with missing or damaged teeth can take a huge toll on your confidence. With the help of Kanata dental, patients can once again feel confident about their smile. Even with teeth that have been previously damaged by gum disease, trauma or decay, crowns can restore the look and function of your smile.